Because most kinds of oil are less dense than water, most spilled oil floats on the water surface. It spreads out and is pushed across the water by wind and currents. How spilled oil affects near-surface creatures depends on when and where the oil spills—those creatures might or might not even be in the area at the location and time of a spill. That's because things are always changing at the surface: flocks of seabirds come and go; plankton, jellyfish, and other kinds of creatures bloom (reproduce) at certain seasons and then die off to become much less numerous at other times. The distribution of plankton and other small organisms is very patchy in space as well as time: if you were traveling around in the water column below the surface, you would find large spaces with not many animals, and then you might encounter a dense cloud of plankton in one spot. How vulnerable near-surface creatures are to the impact of spilled oil also plays a role in the effect it has on these creatures. Birds that float on the water surface and dive to feed can be oiled if they happen to be in the same place as an oil slick. Seabirds keep themselves warm through their feathers, and when these get oiled, the birds become chilled and often die. This is called hypothermia. Since birds preen themselves to clean their feathers, they can also ingest oil, causing illness or death. Marine mammals such as seals, whales, or porpoises must surface to breathe. If they become oiled, this may irritate their eyes or skin, or they may breathe in harmful oil fumes. Seals and sea lions are especially at risk of oiling when their haulout or pupping areas have been oiled. Even though most marine mammals will be able to recover from these types of oiling impacts, some can be much more seriously harmed. There are two types of marine mammals: most seals, whales, and porpoises keep themselves warm by having thick blubber; otters and fur seals keep themselves warm by having thick fur coats. 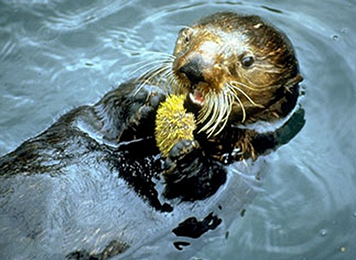 Otters and fur seals are much more vulnerable to oil than other marine mammals. When the fur of an otter or fur seal gets oiled and matted, it can no longer warm the animal, and the animal soon will die of hypothermia. This is why fur-bearing mammals and seals, along with seabirds, are so vulnerable to oil impacts. Creatures well below the surface can also be affected by spilled oil. A small percentage of the spilled oil (how much depends on the type of oil spilled) will disperse naturally down into the water column. 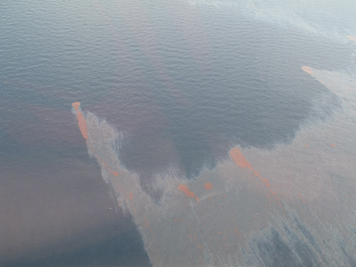 The dispersing oil can affect creatures that live there, such as fish and plankton. Some animals may be able to avoid the oil, by swimming away from it (fish, for example). Others, such as plankton—tiny plants and animals that drift with the currents or swim very weakly—may be hurt or killed by oil in the water column. Go back to the Oil Spills at the Water's Edges page. Oil Spills Along the Shore: Learn how spilled oil can harm marine life when it beaches on the shore. Education: For Students and Teachers: Visit the main education page to explore other ways to learn about the ocean and the impacts of pollution. What Happens to Oil on the Ocean's Surface? Try this simple exercise for elementary school students to demonstrate what happens when oil spills and becomes mixed with the ocean. Oil Spill Assessment and Restoration: Find out about the steps NOAA takes to restore the environment after an oil spill in coastal and marine waters.